Cook laksa today. Give a big bowl to a good friend and hope she likes it. It has been like at least 5 or 6 years since I last had home-made laksa. Going to feed my relatives with them tonite. Heehee. 1. Put paste ingredients into a blender with some water and blend it until fine. 2. Heat up abt 5 tbsp of oil in a wok and fry chilli paste until fragrant. Add in all the coconut milk and seasoning. Add in tau pok and bring to a boil. * Soak dried chilli in hot water until soft. Grind it into a paste. 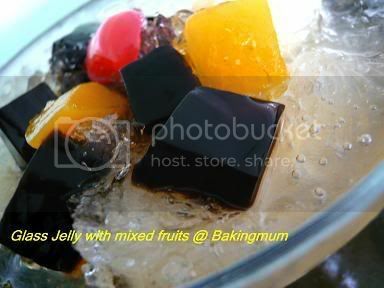 I have also made some glass jelly with mixed fruit cocktail dessert to go with the laksa. Have some spicy laksa, then down it with some cooling glass jelly dessert. The perfect match. 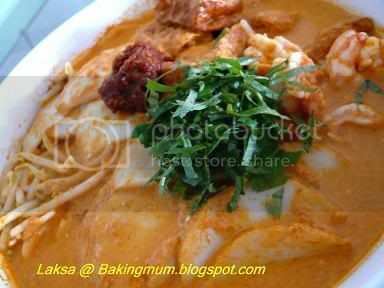 Aunty aunty...Your Laksa looks delicious!! Really wish I could taste it right now! I'm love Laksa alot back home but unfortunately I'm now still overseas studying..sigh~ won't get to eat such nice Laksa...Can Aunty send me the recipe please?... :) Really hope to give it a try soon...Thank you aunty! Emuaks!! I hav been surfing yr blog daily eversince i chanced upon it. I tried out yr sweet bread dough n my hubby n two sons loved them. Yummy. It's one of my hubby's favourites. Can you share tis recipe?? Hi all, please give me some time to have the recipe nicely type out and will post it up for all to try ok. Thanks Auntie for your time! Really appreciate it. Thank you Aunty....I can't wait to cook for my dh next week!! Yummy Laksa!! Emuaks11 thanks alot! I chanced upon your website given by my sister. She had tried your Banana Cake, better than that found in the Cafe! And I have tried your LAKSA. It is very yummy! My hubby said I was like an amateur at it though I tried it for the first time. I have used available ingredients at home. Even without Bunga Kantan, Lengkuas and Chilli paste (I know these things are hard to find abroad), the taste was marvellous. I just add lada padi (small hot chilli) in the blender and more DRIED PRAWNS to enhance the taste. I have used tinned SANTAN and I recommend CHAOKOAH brand Coconut Milk, it never fails me. Thank you for sharing the recipes and I look forward to see more recipes in your blog. Never found the blog as honest as yours! Hi Tiara, thanks for liking my blog. Hope you will continue to visit it. I will try to put up more tried and tested recipes whenever I can. How to I measure by thin & thick coconut milk? Buy from NTUC? Chris, daun laksa is actually laksa leaves. Actually when the recipe says thick and thin coconut milk, they are usually referring to the first squeeze of the coconut milk from the grated coconut. Usually this is squeezed from grated coconut by adding just a little bit of water to become the 1st squeeze. Then the 2nd squeeze will be adding a little bit more water to squeeze out more and thinner coconut milk. Hence the thick and thin coconut milk. In today's context, we buy ready squeezed coconut milk which is always the thicker version. We keep the amount required of thick coconut aside and the rest we just add water to dilute it to become the thinner coconut milk. Hope you understand what I am saying.